О монетах Payment LTD Coins Payment LTD является юридически зарегистрированной частной компанией с ограниченной ответственностью, которая была основана в 2018 году в Панаме. и превратился в открытое акционерное общество, чтобы обеспечить доступ для всех к финансовым продуктам, предлагаемым Coins Payment LTD. Потенциал управления инвестициями, созданный профессионалами, работающими с Компанией, был основной причиной трансформации. 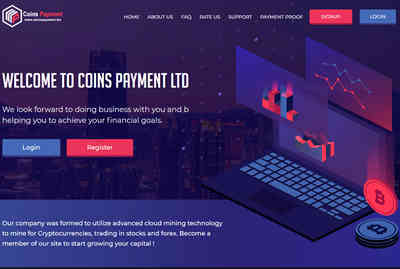 Поскольку Coins Payment LTD продемонстрировала выдающуюся производительность и значительно расширила свои активы в предыдущем периоде, было принято решение начать предлагать свои инвестиционные продукты через специализированные онлайн-сервисы. Компания не является членом, ассоциированным или подразделением какой-либо другой организации, поэтому она может принимать абсолютно независимые решения. Наша команда финансовых экспертов, работающих полный рабочий день, обеспечивает эффективный и быстрый анализ текущей финансовой ситуации. Наша миссия - предоставить каждому человеку возможность получить максимальную прибыль от инвестиций с минимальным риском. 11.09.18 19:55;Account;Receive;Received Payment 24.15 USD from account U16917038 to account U1294000. Batch: 228018508. Memo: API Payment. Withdraw to allhyips from Coins Payment LTD.
12.09.18 20:35;Account;Receive;Received Payment 24.16 USD from account U16917038 to account U1294000. Batch: 228145794. Memo: API Payment. Withdraw to allhyips from Coins Payment LTD.
14.09.18 19:32;Account;Receive;Received Payment 25.24 USD from account U16917038 to account U1294000. Batch: 228375833. Memo: API Payment. Withdraw to allhyips from Coins Payment LTD.
16.09.18 19:32;Account;Receive;Received Payment 24.15 USD from account U16917038 to account U1294000. Batch: 228584885. Memo: API Payment. Withdraw to allhyips from Coins Payment LTD.
15.09.18 21:01;Account;Receive;Received Payment 24.31 USD from account U16917038 to account U1294000. Batch: 228491074. Memo: API Payment. Withdraw to allhyips from Coins Payment LTD.
17.09.18 20:27;Account;Receive;Received Payment 24.31 USD from account U16917038 to account U1294000. Batch: 228716273. Memo: API Payment. Withdraw to allhyips from Coins Payment LTD.
19.09.18 20:19;Account;Receive;Received Payment 24.77 USD from account U16917038 to account U1294000. Batch: 228970644. Memo: API Payment. Withdraw to allhyips from Coins Payment LTD.
18.09.18 21:30;Account;Receive;Received Payment 24.00 USD from account U16917038 to account U1294000. Batch: 228851626. Memo: API Payment. Withdraw to allhyips from Coins Payment LTD.
18.09.18 19:47;Account;Receive;Received Payment 0.78 USD from account U16917038 to account U1294000. Batch: 228842479. Memo: API Payment. Withdraw to allhyips from Coins Payment LTD.
20.09.18 20:54;Account;Receive;Received Payment 0.96 USD from account U16917038 to account U1294000. Batch: 229092089. Memo: API Payment. Withdraw to allhyips from Coins Payment LTD.
22.09.18 20:16;Account;Receive;Received Payment 24.46 USD from account U16917038 to account U1294000. Batch: 229302038. Memo: API Payment. Withdraw to allhyips from Coins Payment LTD.
21.09.18 19:56;Account;Receive;Received Payment 24.81 USD from account U16917038 to account U1294000. Batch: 229199014. Memo: API Payment. Withdraw to allhyips from Coins Payment LTD.
23.09.18 20:04;Account;Receive;Received Payment 24.00 USD from account U16917038 to account U1294000. Batch: 229397565. Memo: API Payment. Withdraw to allhyips from Coins Payment LTD.
25.09.18 20:34;Account;Receive;Received Payment 24.00 USD from account U16917038 to account U1294000. Batch: 229641416. Memo: API Payment. Withdraw to allhyips from Coins Payment LTD.
26.09.18 19:48;Account;Receive;Received Payment 24.00 USD from account U16917038 to account U1294000. Batch: 229753672. Memo: API Payment. Withdraw to allhyips from Coins Payment LTD.
27.09.18 21:32;Account;Receive;Received Payment 24.00 USD from account U16917038 to account U1294000. Batch: 229877508. Memo: API Payment. Withdraw to allhyips from Coins Payment LTD.
29.09.18 19:48;Account;Receive;Received Payment 24.00 USD from account U16917038 to account U1294000. Batch: 230089745. Memo: API Payment. Withdraw to allhyips from Coins Payment LTD.
01.10.18 19:46;Account;Receive;Received Payment 24.00 USD from account U16917038 to account U1294000. Batch: 230640231. Memo: API Payment. Withdraw to allhyips from Coins Payment LTD.
30.09.18 19:40;Account;Receive;Received Payment 25.00 USD from account U16917038 to account U1294000. Batch: 230186280. Memo: API Payment. Withdraw to allhyips from Coins Payment LTD.
03.10.18 21:26;Account;Receive;Received Payment 24.00 USD from account U16917038 to account U1294000. Batch: 230885986. Memo: API Payment. Withdraw to allhyips from Coins Payment LTD.
03.10.18 21:23;Account;Receive;Received Payment 24.00 USD from account U16917038 to account U1294000. Batch: 230885733. Memo: API Payment. Withdraw to allhyips from Coins Payment LTD.
05.10.18 20:23;Account;Receive;Received Payment 24.00 USD from account U16917038 to account U1294000. Batch: 231122004. Memo: API Payment. Withdraw to allhyips from Coins Payment LTD.
08.10.18 04:48;Account;Receive;Received Payment 48.00 USD from account U16917038 to account U1294000. Batch: 231353081. Memo: API Payment. Withdraw to allhyips from Coins Payment LTD.
10.10.18 04:42;Account;Receive;Received Payment 24.00 USD from account U16917038 to account U1294000. Batch: 231612963. Memo: API Payment. Withdraw to allhyips from Coins Payment LTD.